Previous articles of this manual talked about profiles (Profiles: the corner stone of pdfToolbox) and process plans (When profiles are not enough: Process Plans), but only on how to run those manually on PDF documents you open in pdfToolbox Desktop. 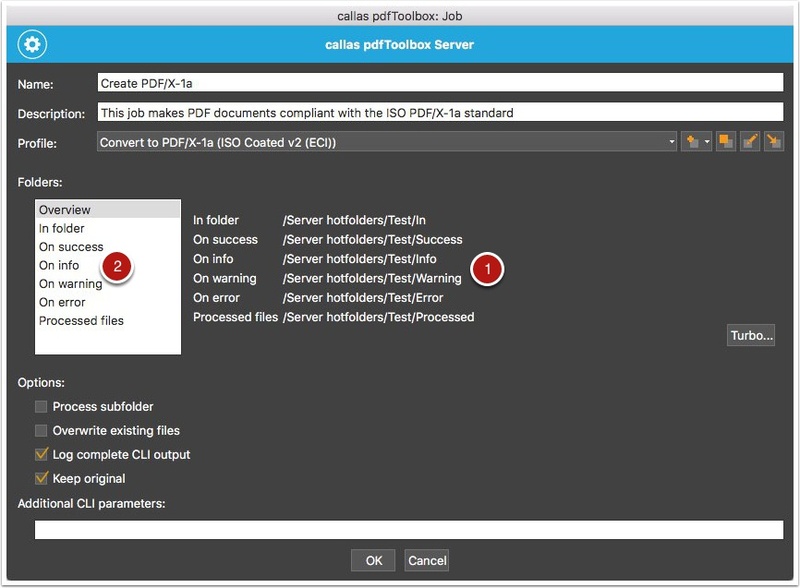 Of course there are times where it is more efficient to process PDF documents automatically – and this article describes how to do that using hot folders in pdfToolbox Server. 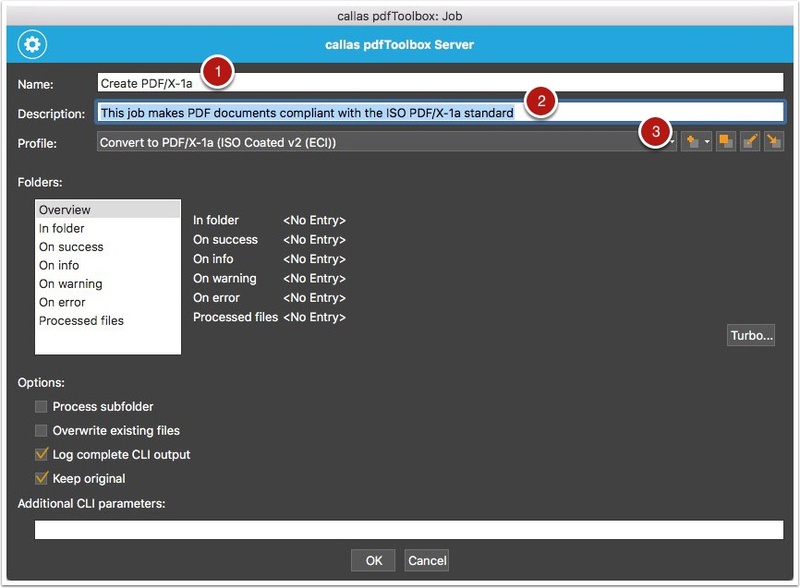 pdfToolbox Server is one of the automatic flavors of the pdfToolbox product family. It is capable of handling any number of jobs; each job is a hot folder setup with an input folder and one or more output folders. PDF documents dropped into an input folder are picked up and processed automatically. Click the "Tools" > "Server" menu item. 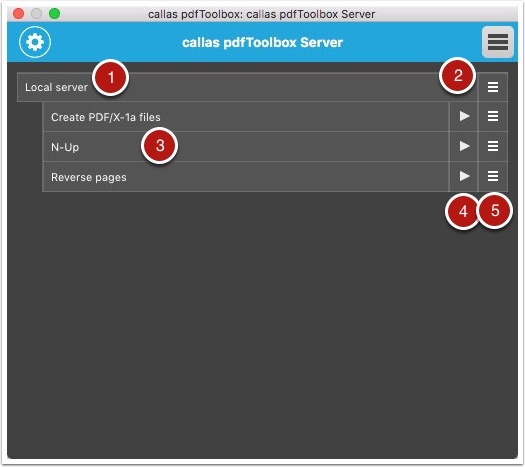 Use "Start a Server" to launch pdfToolbox Server on the same machine as pdfToolbox Desktop. 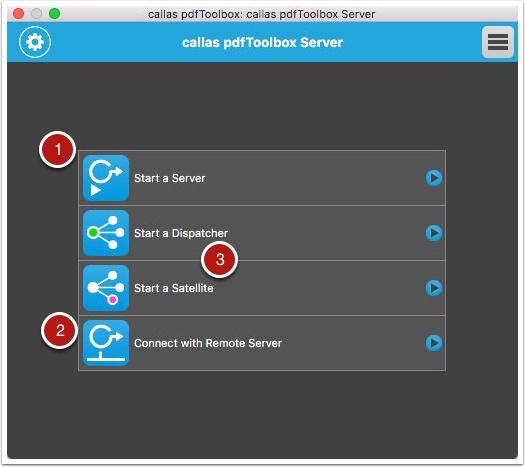 Use "Connect with Remote Server" to connect to a pdfToolbox Server instance that is already running either on the same machine or on a different machine on the network. This allows remote monitoring and configuration over the network. You will need to know the IP address of the machine running pdfToolbox Server. "Start a Dispatcher" and "Start a Satellite" are part of the distributed processing system available in pdfToolbox. This is not further described in this overview manual. Assuming pdfToolbox Server is installed on the same machine as pdfToolbox Desktop, we can start it locally. To do so, click the "Start a Server" button in the pdfToolbox Server control panel. Because this is a local server (on the same machine as our pdfToolbox Desktop), the control panel shows "Local server". If we had connected to a remote server, the IP address of the remote machine would be shown instead. The server action button gives access to configuration possibilities for the pdfToolbox Server instance (including the ability to start a new job or to stop the server). Underneath the server row, the different configured jobs are shown. Each job is a hot folder setup that can process files using a specific profile or process plan. Next to the name of the job, the control panel shows the "Start" / "Stop" button. Clicking the triangle will start processing for this job, clicking the square will stop the job. Next to that is the job action button which gives access to the job configuration. Click on the action button next to the server you want to create this job in. Click the "Create new job" menu item. Each job has a name, which is shown in the server control panel. Choose a unique, descriptive name. Optionally provide a description for the job. Select a profile or process plan for this job to use. The pull-down menu shows all profiles and process plans in the currently active library in pdfToolbox Desktop. You can search in the list by entering your search terms in the search field at the top of the list. This just leaves setting up the different hot folders. To do this you can select each of the folders in the list on the left, or you can use the "Turbo..." button. When using the turbo button, you have to select a folder and pdfToolbox will automatically create sub folders in that folder for you for all of the folders it needs. After using the "Turbo..." button, all paths have been set to sub folders of the main folder selected (in this example "/Server hotfolders/Test"). - "Overview" is the overview shown in the screengrab above. - "In folder" lets you define the input folder. This is the actual watched folder where files are going to be picked up from. - "On success" is the folder processed files are dropped in if there are no info messages, warnings or errors during processing. - "On info" is the folder processed files are dropped in if there is at least one info message, but no warnings or errors during processing. - "On warning" is the folder processed files are dropped in if there is at least one warning, but no errors during processing. - "On error" is the folder processed files are dropped in if there is at least one error during processing. - "Processed files" is the folder where the original files (the ones dropped in the in folder) are moved to if "Keep original" is checked. After configuring the hot folder, click "OK" and don't forget to turn it on in the server configuration panel if you want to test it.